The performance (30 mn) takes place every hour, from 7pm to 1am. 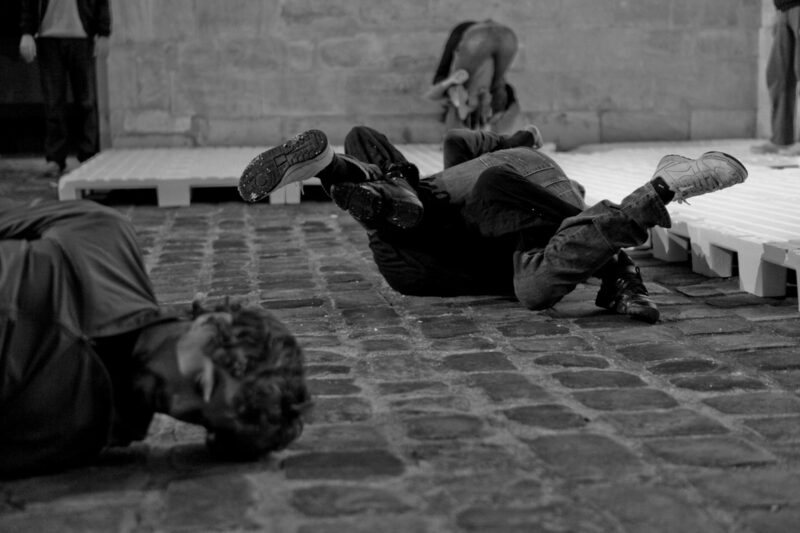 The performers evolve both on the polystyrene structure but also on the paving stones. A text is broadcast during the performance: written for the occasion, it is read by voice recognition software. As the evening progresses, the polystyrene structure disintegrates. The sound generated by the shocks disrupts the listening of the text. The plug is practiced alone or with several people (auto plug, blitz plug, slow plug, 4 arms, 4 legs, total plug, etc.). Consists in trying, as much as possible, to introduce arms, hands, legs, feet to get stuck. Once stopped, the pluggers stop for a while, can try to move, then unfold member by member.